An Emirati-trained force known as the Giants, backed by Apache attack helicopters, secured an urban area along 50th Street, which leads to the city’s key Red Sea port facilities some five kilometres away, they added. Speaking on condition of anonymity for fear of reprisals or lack of authorization to brief journalists, they said that the Iran-backed Shiite rebels had been firing mainly from elevated and rooftop sniper positions, and have now resorted to burning tires to obscure the gun ships’ view. Most civilians have fled the area, they said. Dozens of fighters have been killed and hundreds wounded from both sides since a renewed coalition offensive on the city began five days ago, following calls by U.S. President Donald Trump’s administration for a ceasefire by late November. The fighting has left dead bodies lying on the ground and inside burned out vehicles at the city’s edge, according to witnesses. They said several civilians have been killed by shelling in residential areas. The Saudi-led coalition, which seeks to restore to power to the internationally recognized Yemeni government, has been at war with the Houthis since March 2015. The stalemated conflict has generated the world’s worst humanitarian crisis. 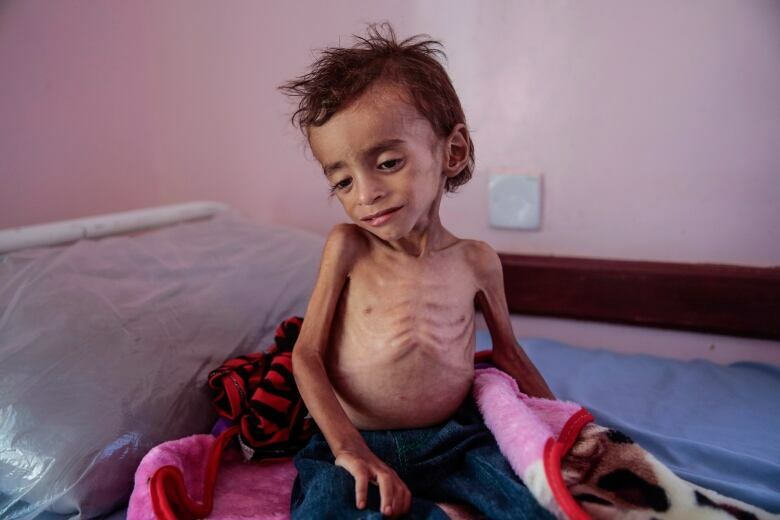 The head of the UN’s food and agriculture agency and other groups say the conflict has pushed Yemen to the brink of famine. “We are watching before our eyes an unprecedented human tragedy,” Food and Agriculture Organization chief Jose Graziano da Silva told a high-level briefing on food insecurity at the UN in New York. “Yemen is living proof of an apocalyptical equation: conflicts and food security go hand in hand, and when there is an overlap of climate change and conflict, famine is already on the horizon,” he said. Besides Dhale, other active fronts in Yemen include the provinces of Bayda, to the south, and the Houthis’ northern strongholds of Hajjah and Saada. The United States has sold billions of dollars’ worth of arms to Saudi Arabia and provides logistical and other support to the coalition. Canada also has a multi-billion dollar arms contract with the Saudis to supply the kingdom armoured vehicles. The rebels, who brandish “Death to America and Israel” slogans, accuse the coalition of being stooges of masters in Washington and Israel. Victoria’s Secret 2018: When is catwalk show? When will fashion show be on TV?